If you are looking for a licensed drywall contractor LEVEL 5 DRYWALL is the go to company since 1979. 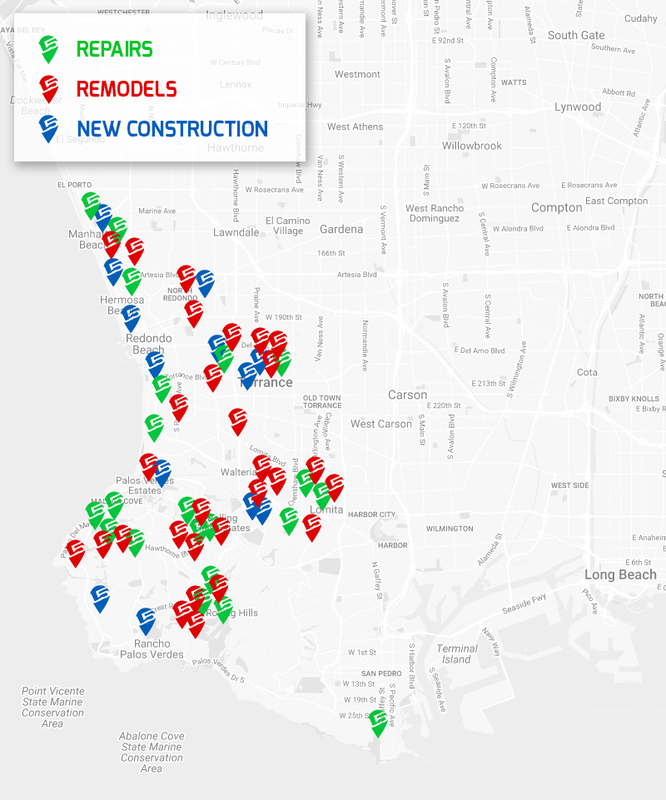 We service the Beach Cities like Manhattan Beach, Hermosa Beach, Redondo Beach as well as Torrance, Rolling Hills and Palos Verdes. I am extremely satisfied customer of Level 5 Drywall. The work is professional, completed on a timely manner and when its done, the team cleans better than a housekeeper! I would recommend them to anyone who needs drywall work done! Level 5 Drywall is amazing. They keep their promises, arrive on time, prepare the work space to keep your home clean, do immaculate work and clean up everything before they leave. I challenge you to find where they patch a wall. It is so well done that you can’t find it. Everyone is polite and they do all you ask of them. It is rare to find a business that is so concentrated on customer service. You will be extremely pleased with their work. A friend of ours referred us to Andres and level 5 drywall for our kitchen remodel. They were always easy to get a hold of, showed up on time, and cleaned up before they left each day. Their communication and work ethic were great. I would use them again. Andres and his team did a great job on our drywall project. We had a number of repairs that needed to be done, which they did flawlessly. They were here on time and their work was top-quality. We would definitely use them again! Andres and his crew did a magnificent job! They were professional, sensitive to time deadlines, tarps were put up to keep the dust contained, final product was better than ever expected. I could not have been happier! Highly recommend! Being a business owner staying open during construction is very important. We had 2 weeks to remodel our new sandal room. I called Andres and he was there in a few days and had the job done before he promise. Andres came to the rescue and ensured we were open before the summer rush! Andres Salgado came to work at my home in Palos Verdes Estates when another contractor was not performing quality work. I talked to Andres about my expectations for the project. His crew jumped in and did an amazing job. I later, had Andres work on my property in the Hollywood Hills. He did me a huge favor by traveling across town to help me complete my project. I would without reservation recommend the team Level Five Sheetrock and it’s owner Andres Salgado. 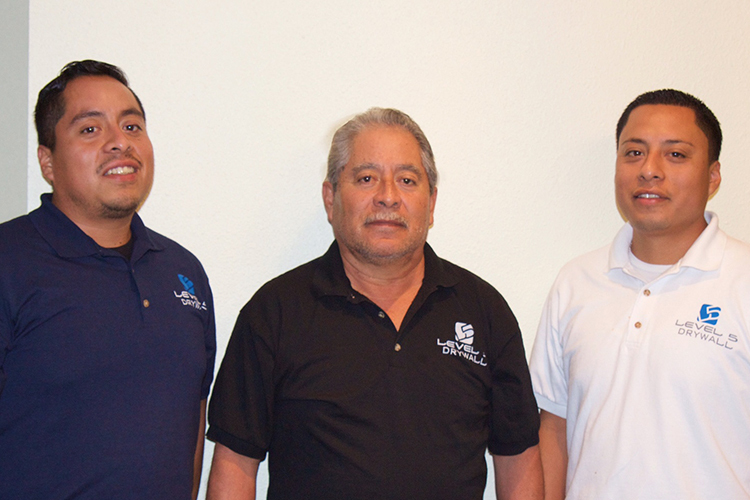 Andre Salgado has worked for us on several occasions as we have moved through our house with renovations. We have found his work to be excellent. Drywallers frequently have a reputation of being ‘messy’. To the contrary, he is very careful and thorough in cleanup. Work areas are sealed off to minimize the mess of drywall work. We have found him to be very dependable, personable, honest with fair estimates and work completed on time. We just had him complete an estimate for our next room renovation! I’ve used Andres (Level 5 Drywall) on multiple occasions for big and small repairs around my house and have never been disappointed. He is always on time and takes the extra time to explain what needs to be done any why. Have never been disappointed by the finished work and clean up is thorough like no one was there. His prices have always been extremely reasonable. I give Andres / Level 5 drywall my highest recommendation and will definitely be using them again when something comes up. 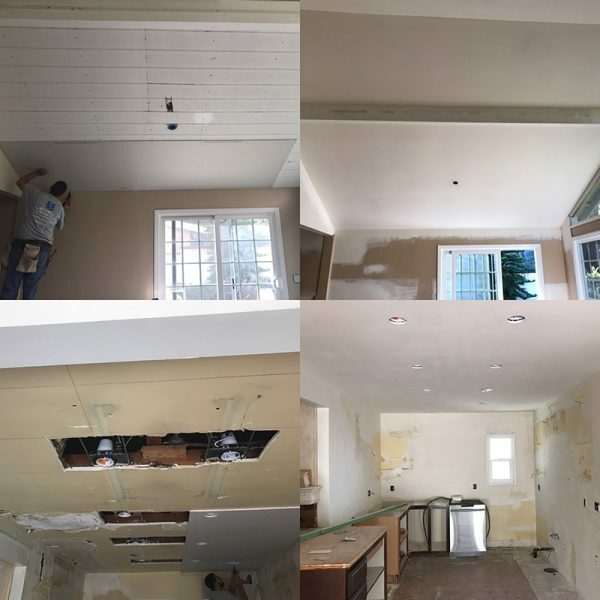 I have used Level 5 drywall many times over the past few years, and each time I am impressed by how courteous, professional, and efficient they are. Their work is of the highest quality and has helped to keep the integrity of our historic home. Andres and his crew are the best! They have the most excellent prices for the services they provide. When I called for an estimate, Andres showed up on time and always gave me a thorough and reasonable estimate. He and his crew showed up on time and their work was amazing. Professional all the way from start to finish. I have recommend Level 5 Drywall to several friends and family members and will never hesitate to call Andres again for quality work! 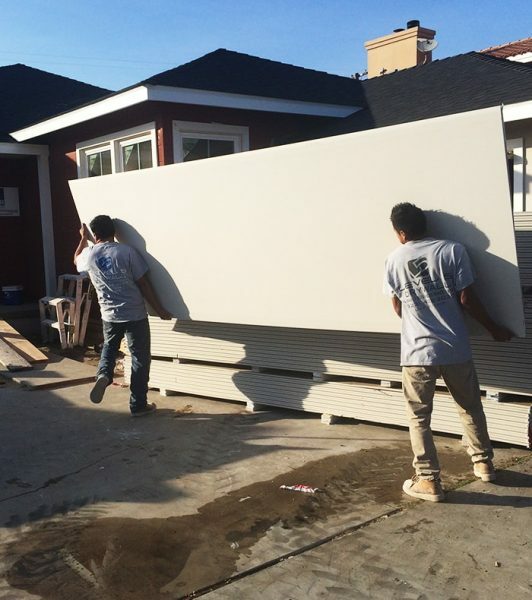 Level 5 is a family business, formerly known as Salgado Drywall, for over 35 years. After years under our father’s training and mentoring we have mastered the drywalling craft. We decided to do things right and become a licensed company. Still providing the same quality service but with the coverage to protect our customers. We are determined to continue our father’s legacy of craftsmanship by providing nothing but the best quality work and service to our customers. 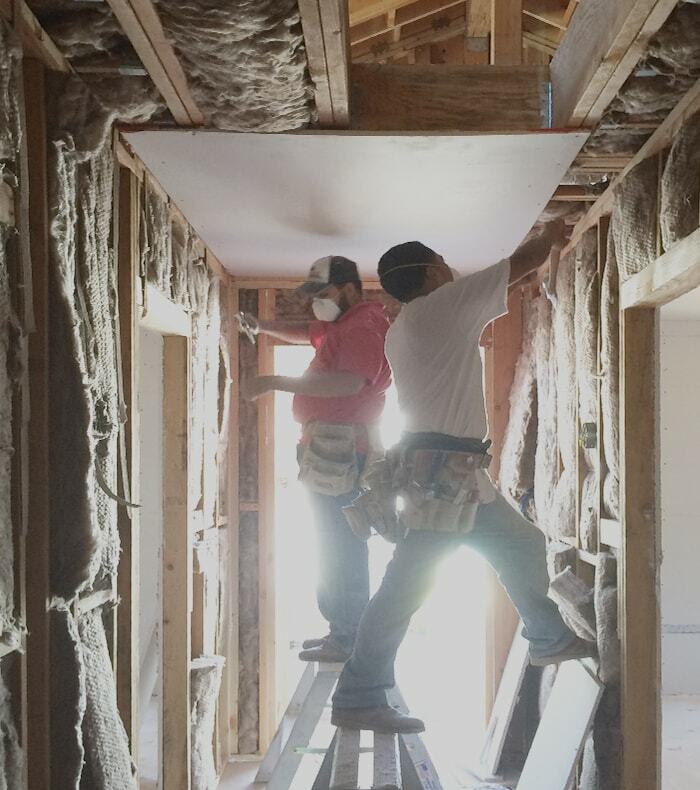 Level 5 Drywall provides quality service to homeowners and contractors seeking a level 5 finish, our area of expertise. 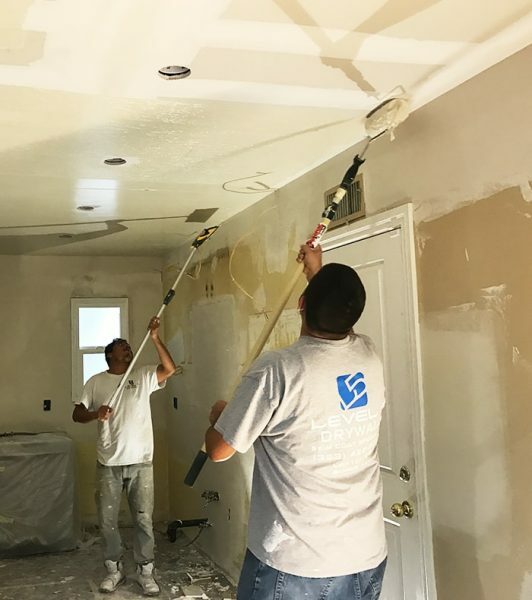 We also specialize in soundproofing, removing acoustic ceilings, electrical wire patching, water damage repair, matching existing texture, and skim coating old walls and ceilings to make them look like new again. From complete drywall work in a custom home to repairing a hairline crack, no job is too small! A level 5 finish is the highest caliber that can be achieved in drywall. Regardless of how skilled the tradesman is and how flat his seams, there is still a difference of texture between the drywall paper and areas where joint compound has been applied. If painting without applying a skim coat, drywall seams may photograph through the paint due to difference of texture. 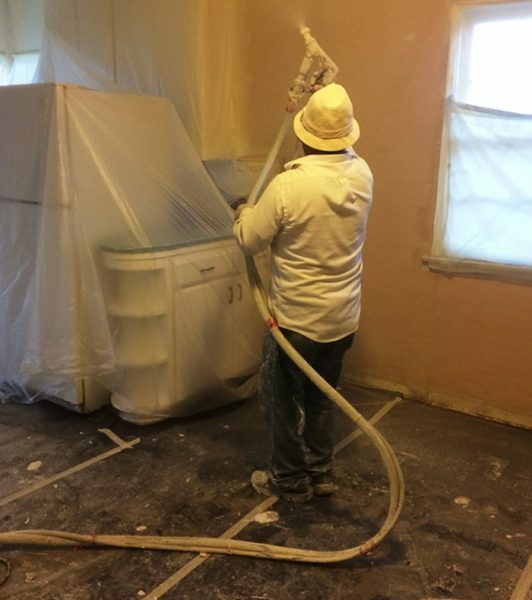 Therefore, by applying a skim coating over the entire surface any incidental imperfections in the drywalled area are filled. This will insure the entire surface will be uniformly smooth across seams, fasteners, and drywall paper. It is highly recommended where high gloss paints and direct lighting or large windows are near. Critical lighting may include side-lighting from fixture or windows. Choose the level based on the area and finish you need. We will also provide our expert advice based on our professional assessment. Give us a call for a free quote. Joint tape is set with a thin layer of joint compound at all joints and interior corners. Joints and fastener heads (nail, screws, accessories) do not need to be embedded with joint compound. Recommended use: plenums above ceiling, attics, service corridors, elevator shafts, concealed and hidden areas. As in level 1, all seams, angles, fastener heads, (nail, screws, accessories) and corner beads are covered with a thin coat of joint compound. The surface must be free from excess joint compound, but tool marks and ridges are acceptable. Recommended use: garages, warehouses, mechanical rooms, and other storage areas. As in level 2, joints, angles, and fasteners will receive an second coat. Joints, fastener heads and corner beads need two coats of joint compound at this level, whereas in level 2 you just need one coat. All surfaces including joint compound, shall be smooth and free of ridges. Recommended use: Where a heavy wall covering or medium to heavy texture will be applied over the wall surface. Fasteners, joints, angles, and corner beads have a total of three coats. Joint compound has been sanded smooth, there cannot be any tool marks or ridges, and is ready to be primed and painted. A level 4 finish is used where flat paints and light textures will be applied. It is the most common type of finish and is considered the typical drywall level of finish. Recommended use: With flat paints or light textures finishes. Enamel, semi-gloss, and gloss paints not recommended for level 4 finish. For a level 5 finish, a level 4 finish is achieved and then a thin skim coat is applied over entire surface. The skim coat can be a joint compound of a manufactured material specifically for this purpose. This skim coat is smooth and does not have any ridges or tool marks and is sanded in detail to a smooth finish. Primer and paint must still be applied. Recommended use: For flat, enamel, semi-gloss, and gloss paints. Additional textures are not recommended. We can’t say enough about the excellent experience we had having Andres and his “Level 5 Drywall” crew take care of our drywall needs after a major remodeling project we had done at our home. We had the electrical wiring and lighting fixtures totally upgraded. Wires were replaced and re-routed through every room in the house. If you have ever had this type of electrical work done, you know what a mess that leaves your walls. Every room had holes and large sections of drywall damaged. Andres and his crew know what they are doing and quickly and expertly repaired all the damage. Holes were patched and major sections of the wall were replaced. These guys are truly “craftsman” in what they do. The original drywall in houses like ours was attached with drywall nails. Over time it starts to pull away from the studs and nails start to show thru. Andres re-attached all the loose drywall sheets with drywall screws. They also rounded the corners in the rooms and applied a “skim” coat to all our walls to give them a very finished look. In the industry it is called a “level 5” finish which is the highest degree of quality drywall finish and very few can do it right. 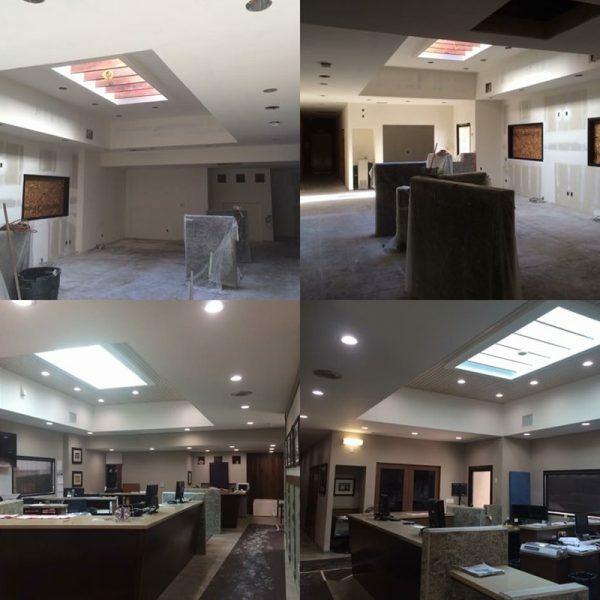 They did such a great job we had them remove our old acoustic ceiling and refinish and skim coat our ceilings as well. The painters and the contractor we had install crown and base board molding all commented on the exceptional workmanship Andres and his crew did on the house. That is really saying something since in their line business they see the full range of bad to good workmanship. If it is done right it also makes their work look better too. Not only are Andres and his crew good at what they do, they are very tidy, protected our furniture and rugs, and kept plaster dust down to a minimum. They cleaned up the site everyday which we really appreciated. Their rates were very reasonable if not the lowest of the crews we shopped around for. We have had a lot of contractors do various work on the homes we have owned and by far Andres and his crew rank at the top of our list. 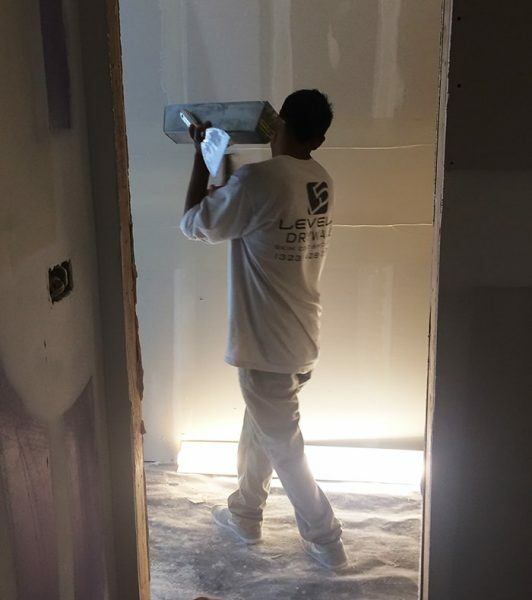 If you are in the need of a highly skilled and professional team to do any kind of drywall work on your home or business I would highly recommend Andres and “Level 5 Drywall”. You will not be disappointed. 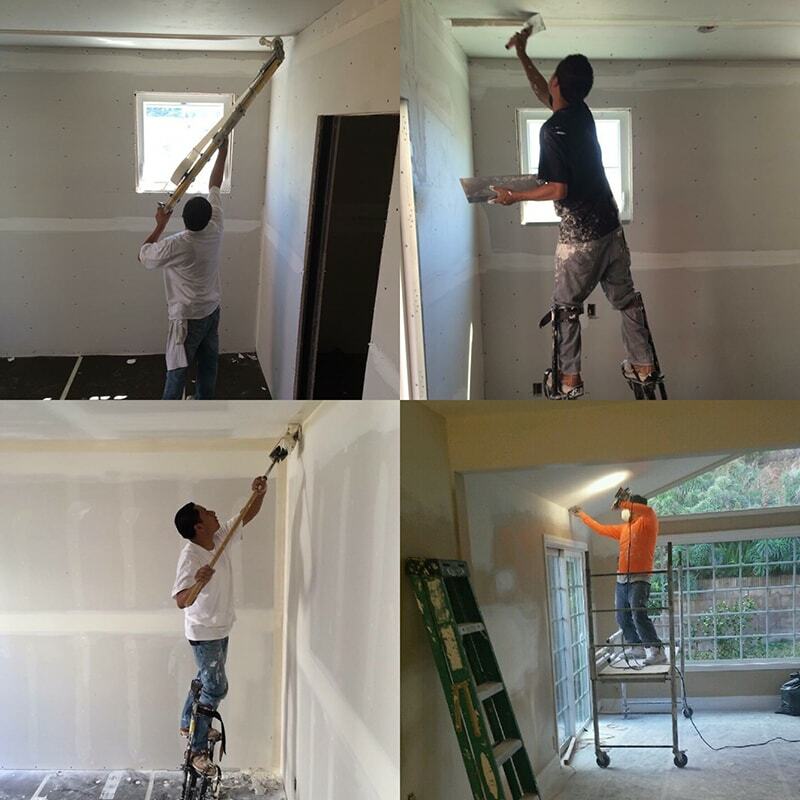 We had two drywall jobs performed by Andres and his company, Level 5 Drywall, – one large and recently a small job. We had to have extensive plumbing repairs done and mold remediation services performed, and subsequently ended up with a big 7 foot hole and three smaller wholes in our living room wall, as well as two large holes in our garage. We had two contractors to look at the job as it involved not only drywall installation but also texturing. One contractor warned us upfront that it will be very difficult to do a texture so it matches identically the existing texture on the walls. The other contractor said almost the same – he will do his best to match the texture but doesn’t guarantee the result. I spoke to Andres over the phone – he was recommended by a remediation company- and he was confident he will be able to match the texture. In both cases I texted Andres some photos of the holes in the wall and on the ceiling. He promptly responded with a reasonable quote and a time he could come. For the small job he came out the following day, which was very important because we needed repairs fast. When Andres’s crew came for a big job, I was surprised to see among his crew members a “Sinatra looking” gentleman – I still remember his stylish hat! – only to learn later that this quiet, nice, and friendly gentleman was Andres’s father, Mr. Eutiquio Salgado. He started this business almost 40 years ago in 1979, and came to help his sons with a big job. The second job, a few months later, required repairs after some lighting changes were made leaving the holes in the ceiling and walls in the bathroom. Both jobs exceeded our expectations. The workmanship in both jobs was of high quality – texture was blended with the old one seamlessly. You cannot detect where the patches were placed or the new drywall installed. We have found Andres and his crew to be very polite, professional, courteous, very tidy, and most important, very skilled at what they do. They showed up on time. They were careful to lay down the paper and plastic to protect our home and cleaned up after the job, leaving the areas spotless. It is rare to encounter exceptional customer services, work ethics and positive attitude nowadays. Thanks Mr. Salgado for teaching your boys the craft of a drywall repair! Amazing job! Andres from Level 5 Drywall earned 5 stars from Me! He and his team were on-time, professional, clean and provided a reasonable-fair price! The center of my family room ceiling was damaged from a water leak, Andres gave me two options, patching the area only or patching the area and re texturing the complete kitchen-family room ceiling. 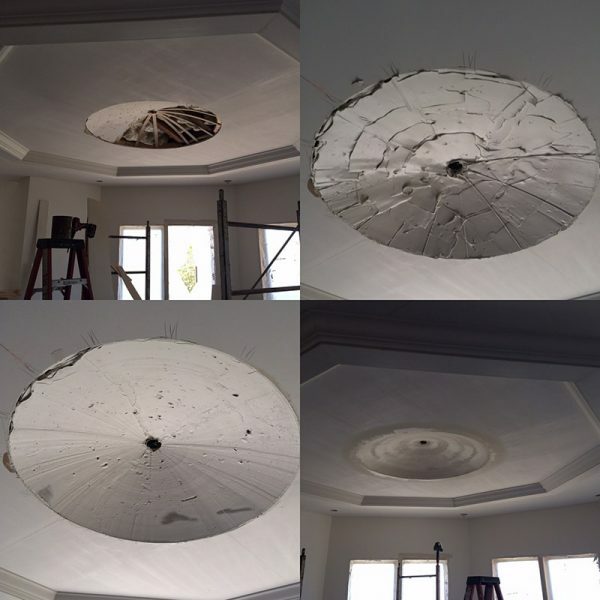 I am so glad I had them do the complete ceiling, it looks fabulous! They were in and out in a few hours, covered my furniture, I had to leave them alone for a few hours and wasn’t concerned as they came highly recommend from a builder friend who is a perfectionist!. I highly recommend Andres and plan on using him again in the future! 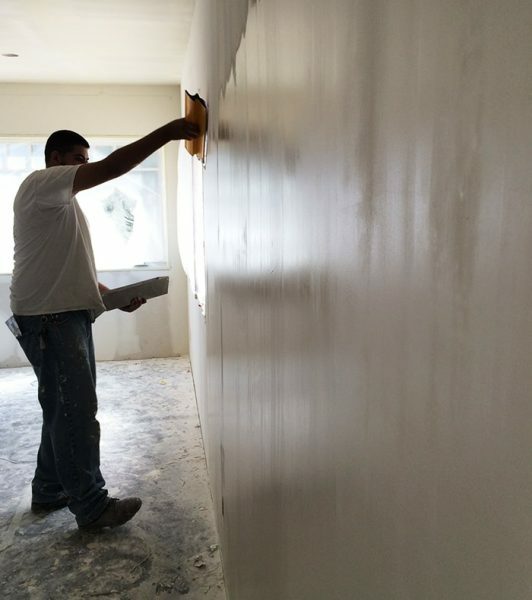 My experience in dealing with Andres Salgado and the Level 5 Drywall team was amazingly positive. They were recommended by a friend of mine who is really perfectionist! I figured if they could make him happy they must be pretty amazing. From the minute I met Andres I knew everything was going to be great. He arrived right on time and provided me with a VERY reasonable quote for the labor and materials that would be needed to transform my garage into a much more attractive space that would be a wise investment in the value of my home. Andres and his family provided the highest quality of work and checked in frequently to show me the progress that was being made and ask if I had any questions. They were efficient and did an outstanding job – completing the task on time. Their attention to detail and ability to deal with complex wires, tubes, switches and other challenges amazed me. I can recommend them most highly and would be happy to speak to anyone on their behalf. They are the experts that I recommend to my own friends, family and clients. I was doing a major remodel on two bathrooms my master bath, second bath, plus a new ceiling in my kitchen because i did a light reconfiguration and a new ceiling in my garage. I had some water damage due to a leak in the deck above the ceiling and i wanted to replaced everything. I hired Andres on a recommendation, do to all my drywalling, mudding, and texture work, I am glad that I did. Andres scheduled and appointment to view the work I wanted done and was friendly from the start, and knows his business, professionally presented ideas and told me exactly how he would accomplish my projects. Andres gave me an estimate in a timely manner. I had several crews working on my projects and Andres fit his schedule around mine and it worked out great. Andres and his crew were prompt, respectful neat and clean with regard to keeping sanding contained by tenting, sweeping and vacuuming. Andres is young by age, but a master at his craft using techniques to skim coat, feather, texture and smooth to perfection to make walls and ceilings look magnificent !! If you are in need of some drywall of any kind of finish, I HIGHLY RECOMMEND Andres, give him a call, you will not be disappointed!!!! Andres repaired a gaping hole left in my wall by a restoration company, due to a water pipe leak a couple years ago. After Andres finished the drywall I needed to call a painter. 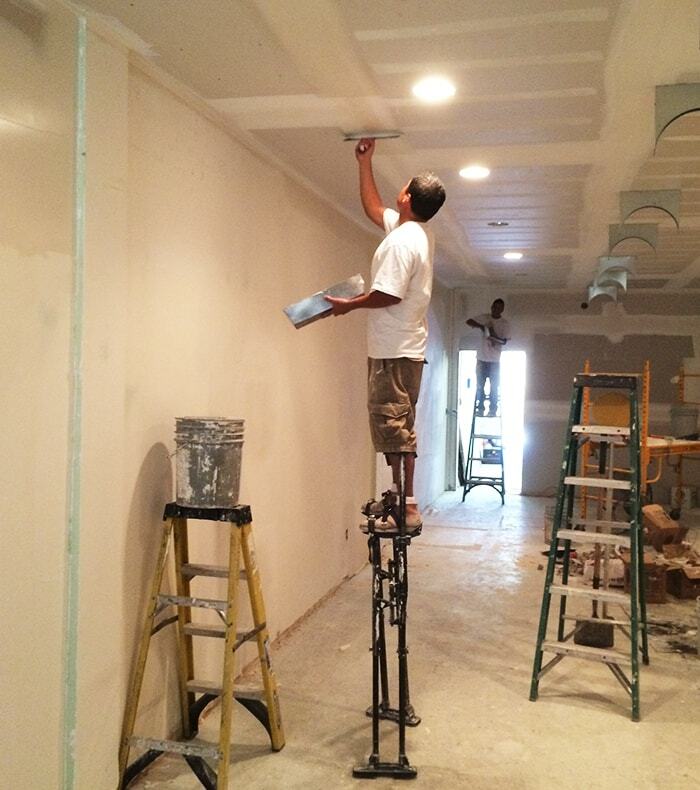 The painter commented on how seamless the drywall job was because he said it made his job so much easier. Fast forward to a year later, I needed to call Andres to drywall another area which had been torn into by the plumber, after another water pipe broke. Andres not only returned my call right away, but showed up at the time he said he would. 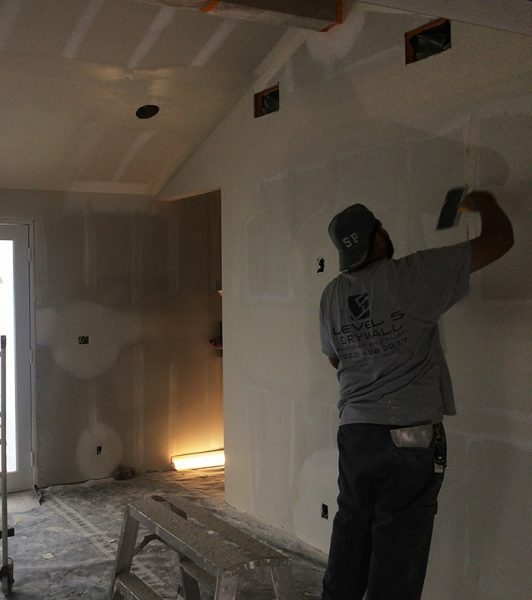 I found out that drywalling is a messy job, but I was impressed that after each job, Andres cleaned up everything and asked for my feedback on his work. I have used Andres twice more: once to repair a wall area after sconces were installed and another time when I moved a chandelier. Andres was recommended to me by a contractor, and I wouldn’t hesitate to call Andres again because his work is professional and he completes the job when he says he will.